Search for hidden collectibles and morphing objects. Enjoy exclusive concept art, music, achievements, replayable HOPs, and more! Vermillion Watch: Order Zero Collector's Edition is rated 3.6 out of 5 by 41. 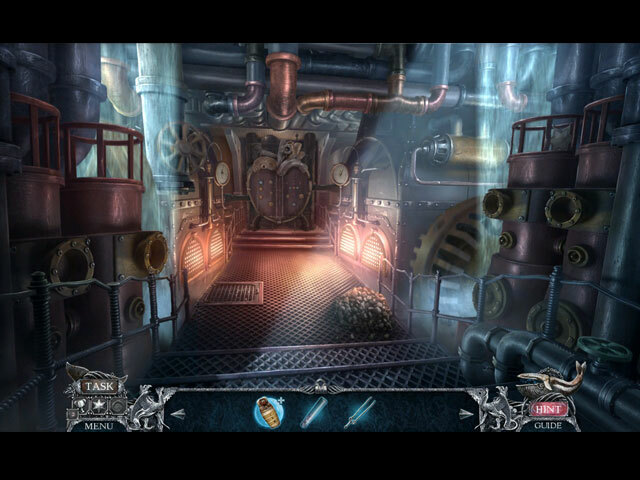 Rated 5 out of 5 by Majestyx12 from More of a Puzzle game than a Hidden Object game Replay 14 hops and 31 mini-games. This tells you were their focus is, the mini-games. One hop didn't have a arrow to move to extended view when I hit hint it took me to the other side and when I wanted to get back over I had to drag the scene. I strongly disliked the morph in the hops, they were not objects but small graphics lines moving. I found the hops hard to see, like they were in the dark and some of the scenes too. There is 2 places I noticed that I needed to pick up ruby slipper for a collectible but I was way past it to go back. I may have to play it again to get them. When I waited for it to be dark outside I could see it better. I liked all the familiar characters. They had personality. Even with my beefs, I really enjoyed playing and almost forgot about the old school hints in games. I was amazed when I figured most out on my own. Still I don't think I would play this game without the guide. I didn't have a indication at the zoo about the dial numbers or I missed it, but it was in the guide. Rated 5 out of 5 by woodawooda from This game is perfection! I am entranced by the vermilion watch team I love this game. I have enjoyed the entire series, and this one is quite special. The subtle details in every scene are amazing. Each location has a special feel, and the graphics are beautifully rendered and true to the period. Epix always adds lots of nuance and humor to their games. They do their research and create a time and place that we are familiar with and can relate to. This series, in particular, is more intelligent than most. We have to use some strategy. We have all watched Victorian mysteries and know the books from which the characters are drawn. No silly monsters are flying at us, no portals to other impossible worlds and no shadow creatures. Just characters with personalities that have a mission to accomplish. The good guys are good, and the bad guys are bad. If you like fake monsters and lunatics trying to rule the world by hooking people up to machines that take their life forces from them, you may not like this game. None of that here. My favorite part of the series is the headquarters where we go with our clues. After we have gathered clues at a location, we return home to discuss with the vermilion watch team where to go next. What should our next move be based on what we know and which team member will we choose to advise us? I love that. In summary, the game play is enchanting with fabulous graphics, fun accents, amazingly clever puzzles and HOP scenes. Add a bit of humor and the above average story telling, and we have a winner. This game is well designed and well thought out. Because of the effort of the development team our experience so much richer I hope you will enjoy, at least try the demo. You have nothing but a little time to lose if it is not your type of game and a fun few hours to gain if you like it. Rated 5 out of 5 by biscuitsmama from THE ORDER ZERO (OZ) TEAM HAS ARRIVED TO SAVE THE DAY After facing some formidable foes such as the Red Queen in your two previous cases, you once again play the game as young Hawkes, one of the newest members of the Vermillion Watch. Along with your companions Phileas Fogg, Rufus, Mr. Singh and a gang of new friends you are off to prevent the theft of an invaluable Egyptian artifact. As you soon learn there is more going on in this cloak and dagger fun fest than meets the eye. Will you survive the challenges as you try to figure out who is friend or foe in this amazing new Vermillion Watch game – Order Zero? The graphics are excellent as are the soundtrack and voiceovers, which is what I expect to find in games from the EIPIX team. Other technical aspects include the various modes of gameplay with the custom mode allowing you to fiddle with the various buttons to set up the game the way you like to play. There is an integrated map available as well. The HOP scenes are varied and quite creative AND more difficult than in other games. There is an interesting HOP where we meet Dorothy and the other members of the Order Zero (OZ) team that I did find a bit difficult because some of the items are very small or fade into the background. Most of the HOPS in the demo are well-designed and seem different than those we have seen before. I am not sure I particularly care for the change in the HOPS and wish this developer would go back to the the HOPS they had in their earlier games. On the flip side, the puzzles are very good and have a higher level of challenge. I found the gate puzzle to be a bit tricky and it took some time to get it right, mainly because I didn’t understand the instructions. There is one other tricky puzzle in the demo where we need to connect the dots across an invitation. If you prefer the CE version of a game this one includes collectibles and morphing objects to find., achievements to earn and the other standard fluff that includes Wallpapers, Concept Art, Pictures, Music, Videos, replay of HOPS and Puzzles, a Strategy Guide and a Bonus Chapter When the Vermillion Watch series was introduced with The Moorgate Accord, I thought it was excellent. I didn’t care as much for the second game but I really like Order Zero. My only complaint is that I think the introduction of a gang of American bounty hunters based on the Oz theme is a bit too much and somehow seems out of place or really not needed. As if the OZ gang didn’t add enough characters to the game we then meet the famous Captain Nemo bunch towards the end of the demo. There so many characters in the game that I had a hard time keeping track of who’s who. By the time the demo ended I wasn’t sure who could be trusted. Even though I feel that the OZ characters are out of place in the game, I still enjoyed the challenges I faced as I tried to find out who was really pulling the strings in this game. Please try the demo to see if this is a game you will enjoy. Happy gaming! Rated 5 out of 5 by scoobydoo2272 from The League of Extraordinary...Wizards of Oz Mash Up!!! Puzzle solvers settle in for a serious game of hidden objects and escape room/scenes!! Take a moment at the beginning of each new scene to prepare to conquer the next challenge that's about to be presented. Focus on solving puzzles instead of looking for items to move on. This game is refreshing!! Rated 5 out of 5 by bonnadonna from Beautiful Game I love this series, Once I start playing its hard to stop! Rated 5 out of 5 by LogieBaby from It's been a long wait for this one and the wait is worth it !! Having beta tested Order Zero 2 or 3 months ago, I awaited the release of the 3rd Vermillion Watch with much anticipation. Now that OZ is here my enjoyment from the beta is confirmed. We are playing as Hawkes, a detective, who has the benefit of being more than ably assisted by none other than Phileas Fogg of Around the World in 80 Days fame, along with Fogg's ally Rufus. In this edition of the series Hawkes must do what is necessary to prevent thefts of precious Egyptian artifacts. I do admit the inclusion of new characters with monikers such as Nemo ( a villainess in this piece ) Ahab ( looks to be a good guy ) and folks straight out the Wizard of Oz seems way too hokey. Upon reflection since the game title Order Zero is a given, the use of OZ-named personnel seems apt. Borrowing the other names such as Nemo does not detract from the game for me. IMO Eipix is using them as an honor to characters found in some of the world's most honored literature. Visually Order Zero is stunning. All of the human renditions are extremely life-like which is a feature I feel most players appreciate. The background scenery in these VM games is also graphically spot on. I can abide with cartoonish graphics in some games but the realism here is a much needed element. The game play itself is what propels Order Zero to lofty heights. We do start out with an HO segment requiring finding 5 keys and this is rather old hat. Yet ( at least in the demo ) the game avoids the clichéd items so prevalent in way too many other games. We do not need a bottle of oil, a ladder, a torch etc. to further the game. Instead we are tasked with locating items specific to an Egyptian setting such as Anubis jars, scepters and weapons for a mummy case and so on. As to puzzles we get a scavenger hunt, donning a specific disguise, an intricate locksmith maze and others the completion of which involves some degree of thought. This being a CE version, the game includes stars as collectibles and morphing items scattered throughout. Is this game for everyone? NO. No game fits that bill. I have yet to see one HOPA that has been universally acclaimed. What I particularly enjoy in Order Zero are the look and feel of the game. It satisfies me on every level. I suppose that with time Vermillion Watch could devolve as so many other series have suffered. But for now the 3rd installment is a precious jewel. As we are in the second half of 2017 and there have been but a couple handfuls of excellent games, I personally relish Order Zero. As some reviewers often say: judge for yourself. Rated 4 out of 5 by codom from Very Good Game I'm not usually a big fan of Eipix games because of fuzzy graphics on larger screens. That said, they did a very nice job on this game and the fuzziness issue seems to be much less of an issue also. (Think that is due to the darker tones). They also seem to have reverted to their previous type of graphics (Yay!) 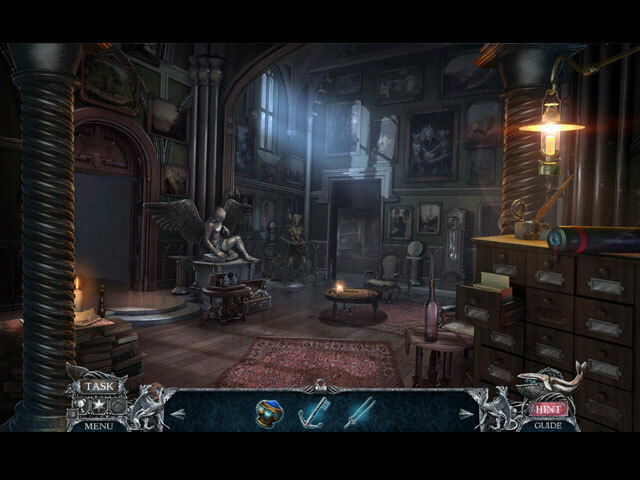 At any rate, the story was engaging and the puzzles were medium to difficult in complexity. More like this EIPIX! Rated 4 out of 5 by dancemom1 from Nemo, Ahab, Dorothy and the gang...what a group of characters! Hello, friends! As always, I mostly review on the game play and leave the story line to others who do a much better job than I. We have #3 in this wonderful series, and this addition does not disappoint. This game has excellent graphics, very clear, with bright clear true colors. Game play was excellent, I found no glitches or lag time between scenes, and animation was very smooth and nicely done, with realistic movements. The game fit my large screen quite well. Excellent voice overs, very well done and dialog can be clicked through if you read faster than they speak. They are age and character appropriate, and showed emotion in their face and voice, e.g., anger, fear, sarcasm and just plain nasty when needed. The music was well done, when we had it. Sound FX are exceptionally well done, but the game seemed a bit quieter than others in this series. HOPs are nicely done, with highlighted words; interactive lists and item pictures to combine. The scenes are clear and items are not difficult to find. I did not see that you could switch to something else if you didn't care for the HOPs. There are morphing items in the HOPs. These are not that easy to spot either, so be on the lookout for them, as they are somewhat small and morph very quickly. Some of the puzzles were quite challenging and took some time and thought to complete. Not as simple as they looked. Hint system is helpful and it does transport to longer locations. Because of this wonderful feature, I didn't even look at the jump map. You don't do a great deal of back tracking, but there is some. Again, the collectibles were a little disappointing. All I found were very large stars. They could be solid or outlines, but none were difficult to find. Didn't see anything else, but the game could have used a bit more in this department. As I said before, I usually always just review on the game play and not the story line, but I need to say something about this one. Again, I really like how this story starts out by giving you some highlights from the last game in the series. It leads you into a new story, but explains a bit as to why these people are here and what they do. I found this story entertaining and a little different. We have a really fun combination of characters in this game, e.g., Captain Nemo (who is now a woman), Dorothy and all the Oz gang, Ahab, Fogg, etc. It is full of action, adventure and enough challenge to keep you interested and wanting more. This series just keeps getting better and better. As you may know, I rarely give a game 5 stars. It has to be exceptional in all areas for that. The only reason I did not give this one 5, is because I felt the collectibles needed something more, and we needed a bit more dialog. Still, I gave this game a 4.75. I think all levels of players will find this one interesting, fun and challenging. Yes, I am going to add it to my collection. As always, try it for yourself and see what you think. We all have different tastes in games and you may not care for this one at all. Thanks for the reviews. Rated 4 out of 5 by RoseRed7834 from cinematic scenes Too many cinematic scenes. Sometimes one right after the other. I got tired of hitting skip so many times. Overall a pretty good game. Rated 4 out of 5 by pennmom36 from POOR CHOICE OF CHARACTER NAMES BUT SOME OF THE BEST GRAPHICS I'VE SEEN I for one, love this newer series, and the demo was able to hold my attention, however, the storyline isn't quite as good as the previous two games in the series. Vermillion Watch doesn't disappoint when it comes to graphics, this game has some of the best graphics I've ever seen! I knew the graphics were going to be good when the opening scene showed a close-up of the raven blinking. Far too often, the animals portrayed in these games have jilted movements, and walk without moving their limbs, as they glide across the ground. The Giant Schnauzer in this game actually moves realistically and even runs out of the room like an actual dog would at that pace. The only grief I have with this episode, is with the lame character names, based upon the Wizard of Oz. I get it, the game is all about the introduction of the American, Order Zero or OZ, team, but SG is spot on, with this assessment. It seems to me, that this game loosely represents Jules Verne, the Father of Science Fiction, and even Captain Nemo is mentioned, so why did they use characters from the Wizard of Oz? The Red Queen is at it again, always calling the shots from behind the scenes, always one step ahead of Young Hawkes (who will soon be referred to as Old Hawkes) and Phileas Fogg! During the last investigation, there was an unusual amount of robberies, and the Vermillion Watch has been asked to accompany Charles Marlow, the Verne museum curator, as he delivers an Egyptian treasure to its unveiling party hosted by the wealthy Lord Kingsbury. Hawkes discovers that the Watch isn't the only secret organization interested in this organized crime ring, when he meets Dorothy and her undercover cohorts. 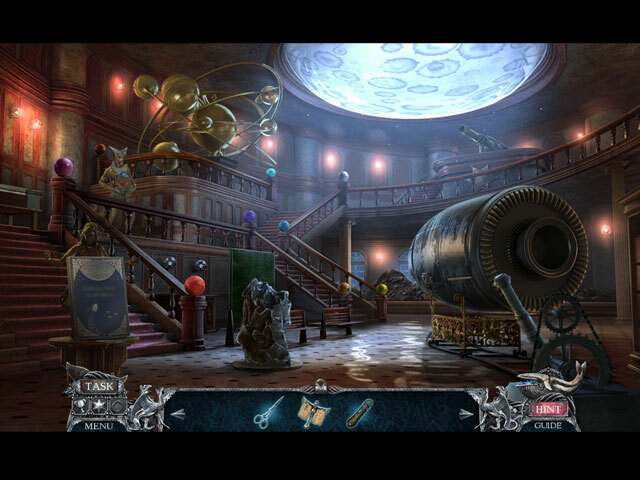 The Hidden Object Scenes aren't all that creative, but I will give them kudos on the fact that they were able to stump me a few times, because some of the objects are either well hidden or cleverly blended into another object. There are Multiple finds of Objects pertaining to a Riddle, Keywords in Sentences, and Listed item finds, and most of the HOP's have a Morphing Object. I love Morphing Objects, but I hate it when the Morphs are only offered within the HOP's. One of my must have features in a game used to be Morphs, but lately I've had to give up on this feature because Morphs that are available in each scene, seem to be a thing of the past. If you love Morphs, and you love a challenge, you should try some of the earlier Dark Parables, which have non-linear Morphs that don't morph in the scene until it has been triggered by an action in a completely different scene, now that's creativity! Some of the Mini Games are awesome, but there are far too many Target games where you click when the target is in the green zone. (these are just too easy and not really fun) Below are brief descriptions of some of the games you'll encounter during the demo: 1) Select and rotate the rings to uncover the correct number of each symbol, as indicated on the clue. 2) Stop the moving circle when it turns a ring green. 3) Select and drag a continuous line between all of the dots without crossing over any flowers. 4) Stop the blue lines when they are on the artifact. 5) Create your disguise by selecting the correct mask pieces based on the photo. 6) Guide the token through the maze using directional arrows. The token will glow green the closer you get. VERMILLION WATCH GAMES AVAILABLE Title***Collector's Edition Release Date***Average Rating -Fleshbound (December 31-16) 3.7 -Moorgate Accord (June 23-16) 3.8 -Order Zero (August 5-17) n/a This Collector's Edition has 15 Achievements to earn, 9 Concept Art pictures, 9 Wallpapers, 9 Dev pictures, 13 Movie Videos, 12 Music Soundtracks, 14 Morphing Objects within the HOP's, replayable Hidden Object Scenes, a Souvenir Room, 31 replayable Mini Games, 42 Hidden Stars, a built in Strategy Guide and a Bonus Chapter, enjoy! Rated 3 out of 5 by 2020moonlanding from Not the best Vermillion Watch I have to admit I was a little disappointed with this new installment of Vermillion Watch. The Wizard of Oz characters were so out of place and annoying. Toto was a bit creepy. Overall verdict... meh. Rated 3 out of 5 by drayfan from Decent but tedious It's a fairly solid basic game, some good challenging puzzles. As I went on though I found the storyline cumbersome and after a while I didn't really care about the story and just wanted to complete the game to do the puzzles. have a good many titles from this company and their games are usually more engaging than this. Rated 3 out of 5 by fiewi1 from Well... I'm not feeling it "Previously in Vermillion Watch..." What a genius idea! Although this title is one of the most flawed one, the concept of having a small story reminding you what happened in all those episodes before, is just brilliant. So many times I've wondered from which point on I continue, in any given game! So many games, so few... brain cells! And that is the only thing I really liked in the game. So, almost every scene contains a star you must collect. The artwork desperately needs and update as always and the first good half of the game is just slow. And exactly because of the mediocre artwork and the overall static feeling, I find myself having difficulty playing the game effortlessly and with anticipation. Every time so! There are big margins of improvement, team! Rated 3 out of 5 by Granny_Gruff from Is OK good Enough? The Vermillion Watch is back for their third installment. This time we will be chasing the Red Queen, again. The new additional characters are once again pulled from fiction. This time we add Dorothy, Toto, The Scarecrow, Tin Woodsman, and the Lion from "The Wizard of Oz," along with Captain Nemo and Admiral Ahab from their respective classics. Reviewer Sunnyglow goes into as much detail as you could possibly want, so I won't rehash her report. I just want to say that this game is much better than the second installment, but not as good as the first. I gave it three stars mostly for not being as bad as #2 and ditching the talking heads in the corner of the screen. There is bling in the CE edition and several different puzzles. The HOPs are multilayered and some have morphs. You'll be collecting Stars in most scenes. Most of the artwork is rather grey toned, but you do get to turn on the lights, sometimes. Please try the Demo for yourself. Rated 3 out of 5 by pcpat923 from EIPIX GETS AN E FOR EFFORT I would like to say that the EIPIX team FINALLY put some effort into presenting an interesting story line along with all the bells and whistles but that would be inaccurate. The puzzles were somewhat challenging which was a plus, however, the story started out one way and then splintered way into left field somewhere. Who exactly is the Watch working for? Suddenly, I'm working for Dorothy who shot at me and is now giving me orders to run after her dog? I don't think so. Also, who is Ahab and will I eventually be hunting for the white whale? I so wanted to like the game and have renewed faith in the broken review system but my head was swimming from the roller coaster story line. My final conclusion is that the EIPIX team should definitely stop drinking the water. Be encouraged, though as there's an abundance of OLDER EXCELLENT GAMES here on BFG and EIPIX has had many good games under their belt--just not this one. Check out my other reviews as I try to always include an excellent older game in the Current Favorite box. Enjoy! Rated 3 out of 5 by cherleadford from Characters are out of Place I enjoyed the graphics and voice overs which were done very nicely. Love the HOPS because they had some different qualities to them. But the names of characters from the Wizard of OZ were really out of place. actually had me thinking, "what in the world, the names of these characters should be in a fairy tale , not a mystery". So many characters and hard to keep up with. I felt the story could have flowed much better then it did. This is not a game I will purchase, but I am sure many will like it. So I will recommend it on that basis. As always, try it before you buy it. Rated 2 out of 5 by Geollyn from Insanely difficult The game has a good story line, excellent graphics, and decent sound. I set the game on the easiest level but still found it too difficult. Since it's a CE, I found myself using the guide book a lot more than I have other games. I usually only need the guide book for puzzles, but this game I had to use it just to figure out what I had to do next. It took away the fun factor :(. Rated 2 out of 5 by LunaNik from Fictional universes collide & destroy your childhood... SUMMARY: Based on the demo, it’s a cookie cutter Eipix game with a storyline that comes across like someone dropped a library into a blender and too easy gameplay that we’ve seen a million times. THE AWESOME The Production—As always, the graphic, animation, and music are excellent. THE GOOD The Extras—Bonus chapter, performance achievements, strategy guide, collectible stars that are easy to find, morphing objects in the HOs, replay both puzzles and HOs, souvenir room, and the dev’s portfolio of wallpapers, concept art, videos, and downloadable soundtracks. THE MEDIOCRE Exploration—The usual unimaginative devices for hiding inventory items: locked inside something requiring a shaped key, submerged in water, tangled in vines, etc. HO Scenes—Mostly multi-layered presentations including combinations of straight lists, interactive lists, drawings, multiples, riddles, and capitalized words in a narrative. Sadly, very few actual hidden objects. THE BAD Convos & Cutscenes—Too many! Challenge Level of Puzzles—Of the eight puzzles, three were throwaway time fillers, four were childishly easy, and only one offered a modicum of challenge. 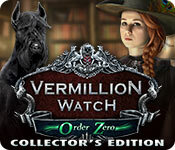 THE HORRIBLE The Storyline—The Vermillion Watch is joined by Order Zero. Dorothy has time-traveled from Depression-era Kansas to Victorian London, and she raided Annie Oakley’s closet on the way. Toto has morphed from a small Cairn Terrier to a huge Airedale. The Scarecrow, Tin Man, and Cowardly Lion are equally unrecognizable. So, two secret societies to fight Captain Nemo and the Red Queen…who are stealing a statue of Ra. This hurts my childhood. CONCLUSION As usual, Eipix offers incredibly high production values, but very little in the way of coherent storyline or challenging, thoughtful gameplay. And those two elements are most important in a game. Here, they’re sadly lacking. Rated 2 out of 5 by kandinsky from A TERRIBLE CONCEPT FLAW IN VERMILLION WATCH GAMES This review is a late one and just about all there is to say has been said by reviewers. I will therefore focus on one problem, as it seems to me. The Vermillion Watch games come to a point where our hero visits Rufus and puts down the "evidence" he has acquired and Rufus tells him that this represents three places he must go. Then the player chooses any one of these for a chapter and then another and then the third, before going on to the final chapter. BUT if the result of one chapter does not have any effect on that of the next and the next (since they can be played in any sequence) then the necessary illusion is broken that one is doing things that have consequence for how the game goes. One might as well skip all three and go directly to the end it would seem. Granted that this is an illusion ,almost all HOPA games are unicursal, have only one possible development. still for me at least this illusion is a vital one in game making. Beyond that as an old Oz fan sort of nice to see Dorothy looking fine in black and shooting at people, but the plot as a whole is it seems to me tiresome. However it is this one concept problem which I would beg the developers to reconsider. Rated 2 out of 5 by crusades from tedious This game is tedious. I bought it on a BOGOF deal and regret it as the continual back and forth to collect things - for which I need so much help as I cannot remember where I saw the items in the first place... - is so boring. The graphics are excellent as always from Eipix. The cast of characters, of which there are far too many, are ridiculous. Wizard of Oz and Ahab ?? blah blah I do not know why we are doing anything... I thought we were stopping a theft but suddenly we are fighting Nemo...who cares anyway. I will not even bother to finish this. Rated 2 out of 5 by lynn106 from Too much story - not enough fun I only played the demo. The characters talk and talk and talk. You do very little besides listen to them. I usually love these games, but this one was not my cup of tea. Give it a try if you like - maybe you will like to watch the story. Rated 2 out of 5 by woodspinner from Another recycled game This game, like most from this developer is long on looks and short on game. The visuals are always great but the features of the game are all recycled from previous installments. Just nothing I haven't seen before. And it really annoys me when talking to a character in the game that I have to click at the end of every sentence. Rated 1 out of 5 by SemeleRhiannon from Worst game ever. I've never hated a game as much as I hate this one. Rated 1 out of 5 by DenSire from Boringly Predictable Boring predictable storyline, bad voice acting, repetitive hidden objects, and a lousy bonus game for a direct sequel. Rated 1 out of 5 by redhood9 from It's a movie not a game This "game" is an interactive movie from the beginning. A little gameplay in the zoo scene, then back to interactive movie. What happened to the great games like MCF where there was actually some gameplay and a challenge? Way too many cutscenes to skip through (to take up time I suppose). If an interactive movie is what you're looking for you'll love this one, otherwise steer clear.